The sea covers two-thirds of the planet and modern State practice shows that a high degree of international cooperation is required to ensure peaceful and sustainable uses of ocean space and marine resources. Moreover, contemporary trends in the law of the sea demonstrates that the development of human expertise and scientific knowledge of the marine environment facilitates good decisions in ocean governance. An important milestone was achieved in capacity development with the establishment of the World Maritime University (WMU) in Malmö in 1983. The University has trained a whole generation of maritime and ocean experts over the past three decades and the remarkable success of the University in this regard can be gauged from the presence today of 4,654 alumni in 167 countries. Among its many distinguished alumni is the IMO Secretary General and Chancellor of the WMU, Mr. Kittack Lim, who studied maritime administration at the University in the early 1990s. 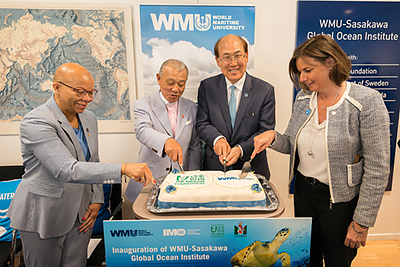 A new chapter in ocean education, research and capacity-building commenced at the University with the inauguration of the WMU-Sasakawa Global Ocean Institute on 8 May 2018. The Institute operates within the framework of the Charter of the World Maritime University and is tangible evidence of the commitment of the University to implement the ocean related goals of the 2030 Agenda for Sustainable Development (the 2030 Agenda), including most notably Goal 4 on Quality Education and Goal 14 on Life Below Water. In particular, the Institute is tasked with research and the delivery of capacity development programmes addressing some of most intractable problems concerning anthropogenic impacts on the ocean environment and the resources that it supports. Furthermore, the founding of the Institute is testament to the unrelenting commitment and vision of Chairman Sasakawa in the development of human resource capacity and the utilisation of education as a means to improve sustainable and peaceful uses of the ocean for the benefit of present and future generations. The establishment of the new Institute has to be viewed within the wider context of the extraordinary philanthropy of The Sasakawa Peace Foundation and The Nippon Foundation in building human resource capacity and in supporting advanced academic research on complicated and contentious ocean issues. The scale and success of these endeavours can be measured from the broad spectrum of programmes the Nippon Foundation has supported since the 1980s. Thus, for example, it champions 30 fellowships per annum for students from developing countries pursuing MSc degrees at WMU. Other remarkable achievements include the Nereus Program, which is an inter-institutional partnership between 17 of the world’s leading universities including the University of British Columbia, Princeton, Stockholm, Duke, Utrecht and Cambridge universities, all of whom are engaged in collaborative natural and social science research pertaining to the ocean. The list of international bodies that have benefited from the largesse of the Nippon Foundation in capacity building is equally impressive and includes the International Tribunal for the Law of the Sea, the International Hydrographic Organization, the Division for Ocean Affairs and the Law of the Sea at the UN, as well as the International Maritime Law Institute (IMLI) in Malta, which has hosted over 150 fellowships. The establishment of the new Institute at the WMU should not therefore be viewed in isolation, as it is intrinsically linked to the major contribution in capacity building made by the Nippon Foundation in assisting international efforts to pass on a sustainable ocean to future generations. Beginning with the UN ‘family’, many international organisations are shaping ocean governance decisions and fostering greater scientific understanding of human impacts on the marine environment. In particular, substantial capacity building and educational efforts in ocean affairs are undertaken by a wide range of UN System bodies through their technical cooperation programmes including those provided by the IMO, IOC-UNESCO, FAO, DOALOS and the ISA, among others. 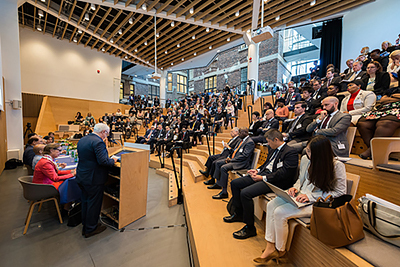 In light of these initiatives and with a view to exploring how the new Institute can best complement existing public and private capacity building efforts, the University convened the WMU Global Ocean Conference on 8 and 9 May 2018. The conference brought together 240 participants from more than 50 countries, along with senior representatives from UN System bodies and selected states, as well as a diverse range of stakeholders and experts from industry and civil society including the Nippon Foundation and the Governments of Seychelles, South Africa, Indonesia, Sweden, Canada, Germany, Norway and Japan. The aim of the conference was threefold, namely: (1) to identify the many threats to the world’s ocean ranging from land-based pollution to coral bleaching, overfishing, marine habitat degradation, ocean acidification and the impacts of climate change; (2) to explore how best to build transformative partnerships between public and private bodies for ocean sustainability in light of the Sustainable Development Goals (SDGs); and (3) to identify research priorities for the future work programme of the new Institute. The 2018 WMU Global Ocean Conference welcomed 240 participants from 50 countries, including from the Nippon Foundation, representatives from the governments of the Seychelles, South Africa, Indonesia, Sweden, Canada, Germany, Norway, Japan, etc., as well as a wide variety of stakeholders and experts from industry and civil society organizations. For the purpose of promoting wide-ranging and inclusive discussions, the Conference was divided into six panels focusing on the theme of building transformative partnerships to implement the ocean-related goals of the 2030 Agenda from distinctive perspectives and constituencies. On the basis of two days of comprehensive deliberations, broad consensus emerged among the participants that the Institute should contribute to the implementation of international ocean governance instruments. There is also universal support for the mission of the Institute, which is tasked with becoming an internationally recognised centre of excellence in ocean governance research, to act as a nexus and convergence point between diverse ocean stakeholders, while building global capacity in ocean governance and contributing to the implementation of Goal 14 of the 2030 Agenda. In realising its vision and discharging its mission, the Institute is informed by five guiding principles drawn from the 2030 Agenda pertaining to people, planet, prosperity, peace and partnerships. In keeping with these principles, the Institute will undertake research and related educational and outreach activities closely aligned with the ocean-related goals of the 2030 Agenda. The changing geopolitical realities of the ocean are complex and demand constant scientific review and analysis from different perspectives. For this reason, the projects and extra-mural activities planned by the Institute are very much focused in taking a long-term perspective and looking ahead to intergenerational impacts of current activities, as well as shorter term impacts over the next 20 to 30 years. 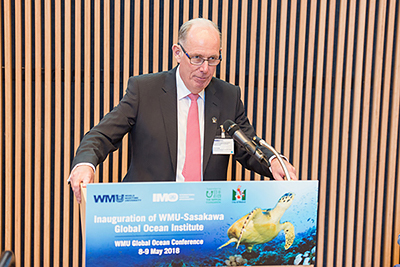 The Agenda is directly linked to the Charter of the WMU, the extensive deliberations undertaken with key stakeholders across a broad spectrum of interests represented at the 2018 WMU Global Ocean Conference, as well as discussions with the principal sponsors from Japan, Sweden, Germany and Canada. The work of the Institute is needs driven and centres in many instances around the core mission of the WMU in assisting international organizations and States, particularly developing countries, as well as other ocean stakeholders in advancing sustainable development under the 2030 Agenda. A key aspect is to work with non-traditional partners from other sectors with a view to developing innovative and radical solutions to some of the most pressing challenges in ocean governance. The work programme includes a spectrum of tailored project initiatives on the following: marine debris; navigational rights and freedoms with an initial focus on the sustainable use of straits used for international navigation; capacity building relating to areas beyond national jurisdiction in conjunction with the International Seabed Authority and the International Maritime Organization, especially in relation to governance issues and the institutional architecture for the implementation of a legally binding instrument under UNCLOS; issues concerning greater convergence between the ocean and climate action legal regimes in line with Goals 13 and 14 of the 2030 Agenda, particularly in the context of sea level rise and the related challenges for the maritime boundaries of Large Oceanic States in the Pacific Ocean; spatial governance of ocean space and ocean leadership in relation to the land-to-sea interface; enduring and emerging challenges in ocean governance pertaining to gender empowerment, as well as concerning the application of new technologies and platforms for data acquisition and sharing. The underlying premise of the work programme is that education, research and human resource development are vital catalysts for engendering a sustainable ocean for the benefit of humankind. This is acknowledged by the UN First Global Integrated Marine Assessment, which points out that achieving sustainability requires a strong understanding of the functioning and importance of the ocean by experts and the public alike. In many ways, the WMU is the embodiment of the axiom that education and capacity development are the twin-motors of sustainable development. Accordingly, as an integral part of WMU, the success of the Institute on the voyage ahead will be determined by how well it mentors a new generation of ocean governance leaders and builds transformative partnerships that make a difference on ocean sustainability worldwide.